The track layout will remain the same. – After the headaches Imagineers were presented with when World of Motion became the first iteration of Test Track and the ride had to be shoehorned into the already constructed building, it doesn’t really come as a surprise to me that Disney wouldn’t want to change the track layout this time around. Each person or group that designed a car will be able to track their progress as they make their way through the attraction in the ride vehicle, a sim car. – I wonder about how this will be achieved. Will it be code names like Sum of All Thrills? Will each seat have a monitor? Will you have a card with your specifications saved on it? A lot of interesting possibilities and wonderful daydreams to be had with this idea until the attraction opens! Scoring on the four critical components (Capability, Efficiency, Responsiveness, and Speed) will be done in stages throughout the attraction with a final score. – This seems like they’ve finally given simple definitions to all of the elements that were test previously (albeit in an entirely new setting). The ability to track your score throughout and after the attraction has the video game (a la Toy Story Midway Mania, Buzz Lightyear’s Space Ranger Spin, etc.) written all over it! The queue is switching gears from the testing arena of the previous incarnation into a design space where guests will design their own vehicle, but also see how Chevrolet designs vehicles. It will include design artwork and pieces directly from Chevrolet. – Designing your own ride vehicle is very cool, but I’m really interested in spending time perusing the items that Chevrolet is pulling back the curtain on. Any time you put together history and design, you have piqued my interest. Guests are not traveling through the world of TRON, but the idea of what a computer looks and feels like on the inside was the inspiration for the design of the attraction. – Considering this is the line of thought we are presented with in the opening minutes of TRON: Legacy, I suspect it will have a TRON-like feel to it whether that was the intent or not. Who wouldn’t want to imagine their jamming through a digital environment on a lightcycle?!?! The design will feature physical elements in addition to projection and video modules. – Disney has been getting better and better at interfusing physical set pieces with visual effects (see Sorcerers of the Magic Kingdom), so I’m curious to see how this plays out in a large scale environment. New soundtrack. – I’m a lover of all things musical in Walt Disney World, so any time there is a new soundtrack I can’t wait to hear it. I’m imagining a hybrid of Daft Punk’s TRON: Legacy score interfused with metallic beats reminiscent of sound=music experiences such as Stomp. New signage. – Very clean and slick design. 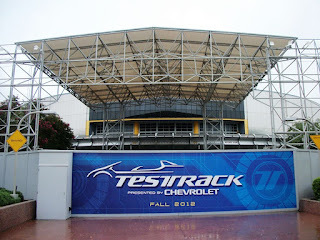 So, there are my thoughts on the current state of Test Track. How excited or saddened are you about the upcoming reopening? What do you think the new attraction will be like? Let’s hear it! I am really, really curious to see how each individual's choices influence the ride experience for each carload. Can't wait to see how this turns out!